Back in the 1970s, NASA’s Mariner and Viking Missions were sent out to explore other planets in our Solar System. All three of them (there were two Viking missions) captured images of Mars’ moon Phobos during their travels. They were our first images of the tiny, potato-shaped moon, and the images held a mystery: strange linear grooves on the moon’s surface. The ESA’s Mars Express probe has been studying Mars and its Moons for many years. While there are several missions currently in orbit around Mars, Mars Express‘s near-polar elliptical orbit gives it some advantages over the others. For one, its orbital path takes it closer to Phobos than any other spacecraft, which allows it to periodically observe the moon from distances of around 150 km (93 mi). Because of this, the probe is in an ideal position to study Mars’ moons and capture images of them. On occasion, this allows for some interesting photo opportunities. For example, in November of 2017, while taking pictures of Phobos and Deimos, the probe spotted Saturn in the background. This fortuitous event led to the creation of some beautiful images, which were put together to produce a video. Since 2003, Mars Express has been studying Phobos and Deimos in the hopes of learning more about these mysterious objects. While it has learned much about their size, appearance and position, much remains unknown about their composition, how and where they formed, and what their surface conditions are like. To answer these questions, the probe has been conducting regular flybys of these moons and taking pictures of them. The video that was recently released by the ESA combines 30 such images which show Phobos passing through the frame. In the background, Saturn is visible as a small ringed dot, despite being roughly 1 billion km away. The images that were used to create this video were taken by the probes High Resolution Stereo Camera on November 26th, 2016, while the probe was traveling at a speed of about 3 km/s. This photobomb was not unexpected, since the Mars Express repeatedly uses background reference stars and other bodies in the Solar System to confirm positions of the moons in the sky. In so doing, the probe is able to calculate the position of Phobos and Deimos with an accuracy of up to a few kilometers. The probes ideal position for capturing detailed images has also helped scientists to learn more about the surface features and structure of the two moons. For instance, the pictures taken during the probe’s close flybys of Phobos showed its bumpy, irregular and dimpled surface in detail.The moon’s largest impact crater – the Stickney Crater – is also visible in one of the frames. Measuring 9 km ( mi) in diameter, this crater accounts for a third of the moon’s diameter, making it one the largest impact craters relative to body size in the Solar System. In another image, taken on January 15th, 2018, Deimos is visible as an irregular and partially shadowed body in the foreground, while the delicate rings of Saturn are just visible encircling the small dot in the background (see below). In addition, Mars Express also obtained images of Phobos set against a reference star on January 8th, 2018 (see above) and close-up images of Phobos’ pockmarked surface on September 12th, 2017. In the future, the Mars Express probe is expected to reveal a great deal more about Mars’ system of moons. In addition to the enduring questions of their origins, formation and composition, there are also questions about where future missions could land in order to study the surface directly. In particular, Phobos has been considered for a possible landing and sample-return mission. Because of its nearness to Mars and the fact that one side is always facing towards the planet, the moon could make for an ideal location for a permanent observation post. This post would allow for the long-term study of the Martian surface and atmosphere, could act as a communications relay for other spacecraft, and could even serve as a base for future missions to the surface. If and when such a mission to Phobos becomes a reality, it is the Mars Express probe that will determine where the ideal landing site would be. In essence, by studying the Martian moons to learning more about them, Mars Express is helping to prepare future missions to the Red Planet. Mars’ moon Phobos is a pretty fascinating customer! 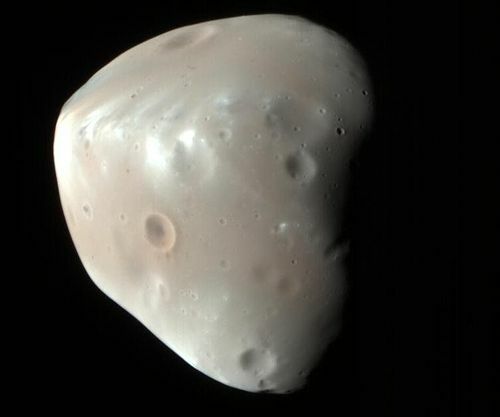 Compared to Mars other moon Deimos, Phobos (named after the Greek personification of fear) is the larger and innermost satellite of the Red Planet. Due to its rapid orbital speed, the irregularly-shaped moon orbits Mars once every 7 hours, 39 minutes, and 12 seconds. In other words, it completes over three orbits of Mar within a single Earth day. It’s not too surprising then that during a recent observation of Mars with the Hubble space telescope, Phobos chose to photobomb the picture! It all took place in May of 2016, when while Mars was near opposition and Hubble was trained on the Red Planet to take advantage of it making its closest pass to Earth in over a decade. The well-timed sighting also led to the creation of a time-lapse video that shows the moon’s orbital path. During an opposition, Mars and Earth are at the closest points in their respective orbits to each other. Because Mars and the Sun appear to be on directly opposite sides of Earth, the term “opposition” is used. These occur every 26 months, and once every 15 to 17 years, an opposition will coincide with Mars being at the closest point in its orbit to the Sun (perihelion). When this happens, Mars is especially close to Earth, which makes it an ideal occasion to photograph it. The last time this occurred was on May 22nd, 2016, when Mars was and Earth were at a distance of about 76,309,874 km (47,416,757 mi or 0.5101 AU) from each other. This would place it closer to Earth than it had been in 11 years, and the Hubble space telescope was trained on Mars to take advantage of this. A few days before Mars made its closest pass, Hubble took 13 separate exposures of the planet over the course of 22 minutes, allowing astronomers to create a time-lapse video. This worked out well, since Phobos came into view during the exposures, which led the video showing the path of the moon’s orbit. Because of its small size, Phobos looked like a star that was popping out from behind the planet. This sighting has only served to enhance Phobos’ fascinating nature. As of 2017, astronomers have been aware of the moon’s existence for 140 years. It was discovered in 1877, when Asaph Hall – while searching for Martian moons – observed it from the U.S. Naval Observatory in Washington D.C. A few days later, he also discovered Deimos, the smaller, outer moon of Mars. In July of 1969, just two weeks before the Apollo landing, the Mariner 7 probe conducted a flyby of Mars and took the first close-up images of the Moon. In 1977, a year after the Viking 1 lander was deployed to the Martian surface, NASA’s Viking 1 orbiter took the first detailed photographs of the moon. These revealed a cratered surface marred by long, shallow grooves and one massive crater – known as the Stickney crater. Asaph Hall named this crater after Chloe Angeline Stickney Hall (his wife) after discovering it in 1878, a year after he discovered Phobos and Deimos. Measuring some 10 km in diameter – almost half of the average diameter of Phobos itself – the impact that created Stickney is believed to have been so powerful that it nearly shattered the moon. The most widely-accepted theory about Phobos origins is that both it and Deimos were once asteroids that were kicked out of the Main Belt by Jupiter’s gravity, and were then acquired by Mars. But unlike Deimos, Phobos’ orbit is unstable. Every century, the moon draws closer to Mars by about 1.98 meters (6.5 feet). At this rate, scientist estimate that within 30 to 50 million years, it will crash into Mars or be torn to pieces to form a ring in orbit. This viewing is perhaps a reminder that this satellite won’t be with Mars forever. Then again, it will certainly still be there if and when astronauts (and maybe even colonists) begin setting foot on the planet. To these people, looking up at the sky from the surface of Mars, Phobos will be seen regularly eclipsing the Sun. Because of its small size, it does not fully eclipse the Sun, but it does make transits multiple times in a single day. So there’s still plenty of time to study and enjoy this fearfully-named moon. And while you’re at it, be sure to check out the video below, courtesy of NASA’s Goddard Space Center! We begin a miniseries on Mars. How many episodes will we do? Who knows? But we start today with a discussion of the two Mars moons, Phobos and Deimos. Mars and Earth have several things in common. Like Earth, Mars is a terrestrial planet (i.e. composed of silicate rock and minerals). It also has polar ice caps, a tilted axis, and evidence of liquid water on its surface. On top of that, Mars and Earth are the only terrestrial planets in the Solar System to have natural satellites. In fact, Mars has two satellites, which are appropriately named Phobos and Deimos (named after the Greek gods of horror and terror, respectively). Of the two, Deimos is the smaller moon and orbits at a greater distance from the planet. And like Deimos, it has the characteristics of an asteroid, which is a strong indication of where it may have come from. Deimos was discovered in 1877 by American astronomer Asaph Hall, who was deliberately searching for Martian moons at the United States Naval Observatory (USNO). Its name was suggested shortly thereafter by Henry Madan, the Science Master of Eton College, and was derived from Homer’s The Iliad. Deimos has a mean radius of between 6 and 6.38 km (3.73 – 3.96 mi). However, the moon is not a round body, and measures roughly 15 × 12.2 × 11 km (9.32 x 7.58 x 6.835 mi), making it 0.56 times the size of Phobos. At 1.4762 × 1015 kg, or 1.4762 trillion metric tons, Deimos is 1/49,735,808 times as massive as the Moon. As a result, Deimos’ surface gravity is very weak, just 0.003 m/s – or 0.000306 g.
Deimos’ orbit is nearly circular, ranging from 23455.5 km at periapsis (closest) to 23470.9 km at apoapsis (farthest) – which works out to an average distance (semi-major axis) of 23,463.2 km. With an average orbital speed of 1.3513 km/s, it takes 30 hours, 18 minutes and 43.2 seconds to complete a single orbit (or 1.263 days). Deimos, like Phobos, is similar in composition to carbonaceous chondrite and silicate/carbon-rich (C- and D-type) asteroids. Though the surface is cratered, it is considerably smoother than Phobos’ surface, which is due to its craters being filled with regolith. Only two geological features on Deimos have been given names – the craters of Voltaire and Swift. These features take their names from the famous 17th/18th century French and English writers who speculated about the existence of two Martian moons before they were even discovered. The origin of Mars’ moons remains unknown, but some hypotheses exist. The most widely-accepted theory states that, based on their similarity to C- or D-type asteroids, they are objects that were kicked out of the Asteroid Belt by Jupiter’s gravity. They were then captured by Mars’ and fell into their current orbits due to atmospheric drag or tidal forces. However, this theory remains controversial since Mars’ current atmosphere is too thin. As such, it is highly unlikely that it would have been able to cause enough drag to slow either moon down enough for them to have achieved their current orbits. A modified version of this hypothesis is that Phobos and Deimos were once a binary asteroid, which was then captured and separated by tidal forces. Other popular hypotheses include that they were formed by accretion in their current orbits, or that Mars was once surrounded by many large asteroids which were ejected into orbit it after a collision with a planetesimal – like the one that formed Earth’s Moon. Over time, these would have fallen back to the surface until only Phobos and Deimos remained. Overall, Deimos history of exploration is tied to that of Mars and Phobos. While no landings have been made on its surface, several have been proposed in the past. The first of these were made as part of the Soviet Phobos (Fobos) program, which involved two probes – Fobos 1 and 2 – that were launched in July of 1988. If the first proved successful in landing on Phobos, the second would been diverted to make a landing on Deimos. However, the first probe was lost en route to Mars while the second managed to returned some data and images of Phobos surface before contact was lost. In 1997-1998, NASA selected the proposed Aladdin mission as a finalist for its Discovery Program. The plan was to visit both Phobos and Deimos with sample return missions involving an orbiter and lander. After reaching the surface, the landers would collect samples and then launch them back to the orbiters (which would return them to Earth). However, the mission was passed over in favor of the MESSENGER probe, which was sent to study Mercury. Other missions have been proposed with are still under study. These include the “Hall” concept proposed in 2008, which calls for a probe that relies on solar-electric propulsion (SEP) to reach Mars and return with samples to Earth. Another was the Gulliver mission, a concept proposed in 2010 which would attempt to retrieve 1 kg (2.2 lbs) of material from Deimos’ surface. The planners behind the OSIRIS-REx mission have also proposed mounting a second mission that would return samples from Phobos and Deimos. And at the 2014 Lunar and Planetary Science Conference, a proposal was made for a low-cost mission based on the Lunar Atmosphere Dust and Environment Explorer. It is named the Phobos and Deimos & Mars Environment (PADME) mission, and would involve an orbiter being sent to Mars by 2021. Deimos has been photographed from the surface of Mars by both the Opportunity and Curiosity rovers. And someday, actual astronauts may be able to look up at it from the Martian surface. From their point of view, Deimos would appear like a star to the unaided eye. At its brightest, it might look like Venus does from here on Earth. For those watching over an extended period of time, Deimos would pass directly in front of the Sun quite regularly. It’s too small to cause a total eclipse, it would look like a black dot moving across the face of the Sun. We have written many interesting articles about Mars’ moons here at Universe Today. Here’s How Many Moons Does Mars Have?, Phobos and Deimos – the Moons of Mars Explained, Phobos and Deimos Together at Last!, Moon Dance: Curiosity Rover Captures Movie of Phobos and Deimos Together and Opportunity sees Phobos and Deimos. For more information, be sure to check out this Solar Views article on Deimos. Astronomy Cast also has some relevant episodes on the subject – Episode 52: Mars, and Episode 91: The Search for Water on Mars. Mars’ natural satellites – Phobos and Deimos – have been a mystery since they were first discovered. While it is widely believed that they are former asteroids that were captured by Mars’ gravity, this remains unproven. And while some of Phobos’ surface features are known to be the result of Mars’ gravity, the origin of its linear grooves and crater chains (catenae) have remained unknown. But thanks to a new study by Erik Asphaug of Arizona State University and Michael Nayak from the University of California, we may be closer to understanding how Phobos’ got its “groovy” surface. In short, they believe that reaccretion is the answer, where all the material that was ejected when meteors impacted the moon eventually returned to strike the surface again. Naturally, Phobos’ mysteries extend beyond its origin and surface features. For instance, despite being much more massive than its counterpart Deimos, it orbits Mars at a much closer distance (9,300 km compared to over 23,000 km). It’s density measurements have also indicated that the moon is not composed of solid rock, and it is known to be significantly porous. Because of this proximity, it is subject to a great deal of tidal forces exerted by Mars. This causes its interior, a large portion of which is believed to consist of ice, to flex and stretch. This action, it has been theorized, is what is responsible for the stress fields that have been observed on the moon’s surface. However, this action cannot account for another common feature on Phobos, which are the striation patterns (aka. grooves) that run perpendicular to the stress fields. These patterns are essentially chains of craters that typically measure 2o km (12 mi) in length, 100 – 200 meters (330 – 660 ft) in width, and usually 30 m (98 ft) in depth. In the past, it was assumed that these craters were the result of the same impact that created Stickney, the largest impact crater on Phobos. However, analysis from the Mars Express mission revealed that the grooves are not related to Stickney. Instead, they are centered on Phobos’ leading edge and fade away the closer one gets to its trailing edge. For the sake of their study, which was recently published in Nature Communications, Asphaug and Nayak used computer modelling to simulate how other meteoric impacts could have created these crater patterns, which they theorized were formed when the resulting ejecta circled back and impacted the surface in other locations. Basically, they theorized that if a meteorite stuck Phobos in just the right place, the resulting debris could have been thrown off into space and swept up later as Phobos swung back around mars. Thought Phobos does not have sufficient gravity to reaccrete ejecta on its own, Mars’ gravitational pull ensures that anything thrown off by the moon will be pulled into orbit around it. Once this debris is pulled into orbit around Mars, it will circle the planet a few times until it eventually falls into Phobos’ orbital path. When that happens, Phobos will collide with it, triggering another impact that throws off more ejecta, thus causing the whole process to repeat itself. In the end, Asphaug and Nayak concluded that if an impact hit Phobos at a certain point, the subsequent collisions with the resulting debris would form a chain of craters in discernible patterns – possibly within days. Testing this theory required some computer modelling on an actual crater. Using Grildrig (a 2.6 km crater near Phobos’ north pole) as an reference point, their model showed that the resulting string of craters was consistent with the chains that have been observed on Phobos’ surface. And while this remains a theory, this initial confirmation does provide a basis for further testing. In addition to offering a plausible explanation of Phobos’ surface features, their study is also significant in that it is the first time that sesquinary craters (i.e. craters caused by ejecta that went into orbit around the central planet) were traced back to their primary impacts. In the future, this kind of process could prove to be a novel way to assess the surface characteristics of planets and other bodies – such as the heavily cratered moons of Jupiter and Saturn. These findings will also help us to learn more about Phobos history, which in turn will help shed light on the history of Mars. And all of this information is likely to come in handy when it comes time for NASA to mount crewed missions to the Red Planet. One of the key steps in the proposed “Journey to Mars” is a mission to Phobos, where the crew, a Mars habitat, and the mission’s vehicles will all be deployed in advance of a mission to the Martian surface. Learning more about the interior structure of Mars is a goal shared by many of NASA’s future missions to the planet, which includes NASA’s InSight Lander (schedules for launch in 2018). Shedding light on Mars geology is expected to go a long way towards explaining how the planet lost its magnetosphere, and hence its atmosphere and surface water, billions of years ago. How Close Can Moons Orbit? The Moon is great and all, but I wish it was closer. Close enough that I could see all kinds of detail on its surface without a telescope or a pair of binoculars. Close enough that I could just reach up and grab enough cheese for a lifetime of grilled cheese sandwiches. Sure, there would be all kinds of horrible problems with having the Moon that much closer. Intense tides, a total lack of good dark nights for stargazing, and something else… Oh right, the total destruction of life on Earth. On second thought the Moon can stay right where it is, thank you very much. The Earth’s Moon is located an average distance of 384,400 kilometers away. I say average because the Moon actually follows an elliptical orbit. At its closest point, it’s only 362,600 km, and at its furthest point, it’s 405,400 kilometers. Still, that’s so far that it takes light a little over a second to reach the Moon, traveling almost 300,000 km/s. The Moon is far. But what if the Moon was much closer? How close could it get and still be the Moon? Once again, I need to remind you that this is purely theoretical. The Moon isn’t getting closer to us, in fact, it’s getting further. The Moon is slowly drifting away from us at a distance of almost 4 centimeters per year. Let’s go back to the beginning, when the young Earth collided with a Mars-sized planet billions of years ago. This catastrophic encounter completely resurfaced planet Earth, and kicked up a massive amount of debris into orbit. Well, a Moon’s worth of debris, which collected together by mutual gravity into the roughly spherical Moon we recognize today. Shortly after its formation, the Moon was much closer, and the Earth was spinning more rapidly. A day on Earth was only 6 hours long, and the Moon took just 17 days to orbit the Earth. The Earth’s gravity stopped the Moon’s relative rotation, and the Moon’s gravity has been slowing the Earth’s rotation. To maintain the overall angular momentum of the system, the Moon has been drifting away to compensate. This conservation of momentum is very important because it works both ways. As long as a moon takes longer than a day to orbit its planet, you’re going to see this same effect. The planet’s rotation slows, and the moon drifts further to compensate. But if you have a scenario where the moon orbits faster than the planet rotates, you have the exact opposite situation. The moon makes the planet rotate more quickly, and it drifts closer to compensate. This can’t end well. Once you get close enough, gravity becomes a harsh mistress. There’s a point in all gravitational interactions called the Roche Limit. This is the point at which an object held together by gravity (like the Moon), gets close enough to another celestial body that it gets torn apart. The exact point depends on the mass, size and density of the two objects. For example, the Roche Limit between the Earth and the Moon is about 9,500 kilometers, assuming the Moon is a solid ball. In other words, if the Moon gets within 9,500 kilometers or so, of the Earth, the gravity of the Earth overwhelms the gravity holding the Moon together. The Moon would be torn apart, and turned into a ring. And then the pieces of the ring would continue to orbit the Earth until they all came crashing down. When that happened, it would be a series of very bad days for anyone living on Earth. If an average comet got within about 18,000 km of Earth, it would get torn to pieces. While the Sun can, and does, tear apart comets from about 1.3 million km away. This sounds purely theoretical, but this is actually going to happen over at Mars. Its largest moon Phobos orbits more quickly than a Martian day, which means that it’s drifting closer and closer to the planet. In a few million years, it’ll cross the Roche Limit, tear into a ring, and then all the pieces of the former Phobos will crash down onto Mars. We did a whole article on this. Now you might be wondering, wait a second. I’m a separate object from the Earth, why don’t I get torn apart since I’m definitely within the Earth’s Roche Limit. You do have gravity holding you together, but it’s insignificant compared to the chemical bonds holding you together. This is why physicists consider gravity to actually be a pretty weak force compared to all the other forces of the Universe. You’d need to go somewhere with really intense gravity, like a black hole, for the Roche Limit to overcome the forces holding you together. So that’s it. Bring the Moon within 9,500 kilometers or so and it would no longer be a Moon. It would be torn apart into a ring, a Halo ring, if you will, capable of wiping out all life on a planet infected by the flood. All the moons we see in the Solar System are are least at the Roche Limit or beyond, otherwise they would have broken up long ago… and probably did. Since the Authorization Act of 2010, NASA has been pushing ahead with the goal of sending astronauts to Mars by the 2030s. The latter part of this goal has been the subject of much attention in recent years, and for good reason. Sending crewed missions to the Red Planet would be the single-greatest initiative undertaken since the Apollo era, and the rewards equally great. However, with the scheduled date for a mission approaching, and the upcoming presidential election, NASA is finding itself under pressure to show that they are making headway. Despite progress being made with both the Space Launch System (SLS) and the Orion Multi-Purpose Crew Vehicle, there are lingering issues which need to be worked out before NASA can mount its historic mission to Mars. One of the biggest issues is that of assigned launched missions that will ensure that the SLS is tested many times before a crewed mission to Mars is mounted. So far, NASA has produced some general plans as part of it’s “Journey to Mars“, an important part of which is the use of the SLS and Orion spacecraft to send a crew beyond low-Earth orbit and explore a near-Earth asteroid by 2025. This plan is not only intended to provide their astronauts with experience working beyond LEO, but to test the SLS and Orion’s capabilities, not to mention some vital systems – such as Solar Electric Propulsion (SEP), which will be used to send cargo missions to Mars. Another major step is Exploration Mission 1 (EM-1), the first planned flight of the SLS and the second uncrewed test flight of the Orion spacecraft (which will take place on September 30th, 2018). However, beyond this, NASA has only one other mission on the books, which is Exploration Mission 2 (EM-2). This mission will involve the crew performing a practice flyby of a captured asteroid in lunar orbit, and which is scheduled for launch in 2023. This will be the first crewed test of the Orion spacecraft, and also the first time American astronauts have left low-Earth orbit since the Apollo 17 mission in 1972. While significant, these mission remain the only two assigned flights for the SLS and Orion. Beyond these, dozens more have been proposed as part of NASA’s three phase plan to reach Mars. For instance, between 2018 and the 2030s, NASA would be responsible for launching a total of 32 missions in order to send the necessary hardware to near-Mars space before making crewed landings on Phobos and then to Mars. In accordance with the “Evolvable Mars Campaign” – which was presented last year by NASA’s Human Exploration and Operations Mission Directorate (HEOMD) – Phase One (the “Earth Reliant” phase) of this plan would involve two launches in 2028, which would be responsible for transporting a habitation module, an SEP module, and a exploration vehicle to cis-lunar space. This would be followed by two SLS flights in 2029, bringing the Trans-Earth Injection (TEI) stage to cis-lunar space, followed by a crew to perform the final checks on the Phobos Hab. By 2030, Phase Two (known as the “Proving Ground” phase) would begin with the last elements – the Earth Orbit Insertion (EOI) stage and taxi elements – being launched to cis-lunar orbit, and then all the equipment being sent to near-Mars space for pre-deployment. By 2031, two more SLS missions would take place, where a Martian Hab would be launched, followed in 2032 by the launches of the Mars Orbit Insertion (MOI) and Trans-Mars Injection (TMI) stages. By 2033, Phase Three (the “Earth Independent” phase) would begin, where the Phobos crew would be transported to the Transit Hab, followed by the final crewed mission to the Martian surface. Accomplishing all of this would require that NASA commit to making regular launches over the next few years. Such was the feeling of Bill Gerstenmaier – NASA’s Associate Administrator for Human Exploration and Operations – who recently indicated that NASA will need to mount launches at least once a year to establish a “launch cadence” with the SLS. Mission proposals of this kind were also discussed at the recent Aerospace Safety Advisory Panel (ASAP) meeting – which meets annually to discuss matters relating to NASA’s safety performance. During the course of the meeting, Bill Hill – the Deputy Associate Administrator for Exploration Systems Development (ESD) in NASA’s Human Exploration and Operations Mission Directorate (HEOMD) – provided an overview of the latest developments in NASA’s planned mission. By and large, the meeting focused on possible concepts for the Mars mission, which included using SEP and chemical propellants for sending hardware to cis-lunar space and near-Mars space, in advance of a mission to Phobos and the Martian surface. Two scenarios were proposed that would rely to these methods to varying extents, both of which called for a total of 32 SLS launches. 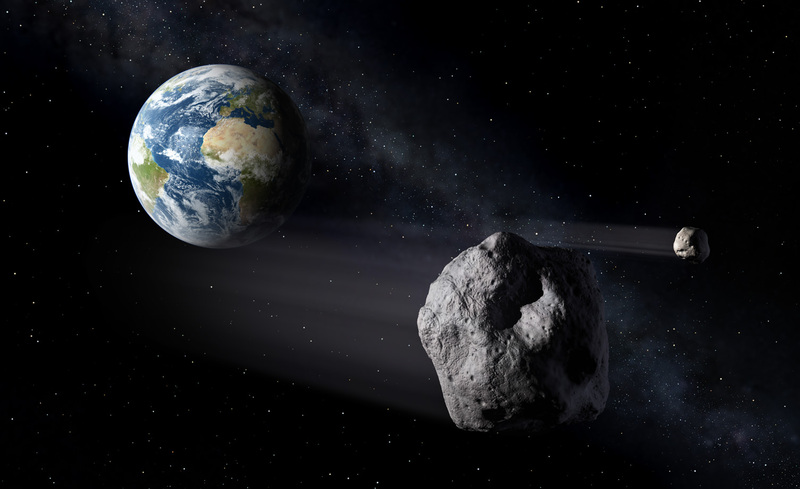 However, the outcome of this meeting seemed to indicate that NASA is still thinking over its long-term options and has not yet committed to anything beyond the mission to a near-Earth asteroid. For instance, NASA has indicated that it is laying the groundwork for Phase One of the Mars mission, which calls for flight testing to cis-lunar space. However, according to Hill, NASA is currently engaged in “Phase 0” of the three phase plan, which involves the use of the ISS to test crew health via long duration space flight. In addition, there are currently no plans for developing Phases Two and Three of the mission. Other problems, such as the Orion spacecraft’s heatshield – which is currently incapable of withstanding the speed of reentry coming all the way from Mar – have yet to be resolved. Another major issue is that of funding. Thanks to the Obama administration and the passage of the Authorization Act of 2010, NASA has been able to take several crucial steps towards developing their plan for a mission to Mars. However, in order to take things to the next level, the US government will need to show a serious commitment to ensuring that all aspects of the plan get the funding they need. And given that it is an election year, the budget environment may be changing in the near future. As such, now is the time for the agency to demonstrate that it is fully committed to every phase of its plan to puts boots on the ground of Mars. On the other hand, NASA has taken some very positive strides in the past six years, and one cannot deny that they are serious about making the mission happen in the time frame it has provided. They are also on track when it comes to proving key concepts and technology. In the coming years, with flight tests of the SLS and crewed tests of the Orion, they will be even further along. And given the support of both the federal government and the private sector, nothing should stand in the way of human boots touching red soil by the 2030s. Many of the planets in our Solar System have a system of moons. But among the rocky planets that make up the inner Solar System, having moons is a privilege enjoyed only by two planets: Earth and Mars. And for these two planets, it is a rather limited privilege compared to gas giants like Jupiter and Saturn which each have dozens of moons. Whereas Earth has only one satellite (aka. the Moon), Mars has two small moons: Phobos and Deimos. And whereas the vast majority of moons in our Solar System are large enough to become round spheres similar to our own Moon, Phobos and Deimos are asteroid-sized and misshapen in appearance. The larger moon is Phobos, whose name comes from the Greek word which means “fear” (i.e. phobia). Phobos measures just 22.7 km across and has an orbit that places it closer to Mars than Deimos. Compared to Earth’s own Moon — which orbits at a distance of 384,403 km away from our planet — Phobos orbits at an average distance of only 9,377 km above Mars. This produces an orbit of short duration, revolving around the planet three times in a single day. For someone standing on the planet’s surface, Phobos could be seen crossing the sky in only 4 hours or so. Mars’ second moon is Deimos, which takes its name from the Greek word for panic. It is even smaller, measuring just 12.6 km across, and is also less irregular in shape. Its orbit places it much farther away from Mars, at a distance of 23,460 km, which means that Deimos takes 30.35 hours to complete an orbit around Mars. When impacted, dust and debris will leave the surface of the moon because they do not have enough gravitational pull to retain the ejecta. However, the gravity from Mars will keep a ring of this debris around the planet in approximately the same region that the moon orbits. As the moon revolves, the debris is redeposited as a dusty layer on its surface. Like Earth’s Moon, Phobos and Deimos always present the same face to their planet. Both are lumpy, heavily-cratered and covered in dust and loose rocks. They are among the darker objects in the solar system. The moons appear to be made of carbon-rich rock mixed with ice. Given their composition, size and shape, astronomers think that both of Mars’ moons were once asteroids that were captured in the distant past. However, it appears that of these two satellites, Phobos won’t be orbiting the Red Planet for very much longer. Because it orbits Mars faster than the planet itself rotates, it is slowly spiraling inward. As a result, scientists estimate that in the next 10-50 million years or so, it will get so low that the Martian gravity will tear Phobos into a pile of rocks. And then a few million years later, those rocks will crash down on the surface of Mars in a spectacular string of impacts. Phobos and Deimos both appear to be composed of C-type rock, similar to blackish carbonaceous chondrite asteroids. This family of asteroids is extremely old, dating back to the formation of the Solar System. Hence, it is likely that they were acquired by Mars very early in its history. Phobos is heavily cratered from eons worth of impacts from meteors with three large craters dominating the surface. The largest crater is Stickney (visible in the photo above). The Stickney crater is 10 km in diameter, which is almost half of the average diameter of Phobos itself. The crater is so large that scientists believe the impact came close to breaking the moon apart. Parallel grooves and striations leading away from the crater indicate that fractures were likely formed as a result of the impact. Much like Phobos, it’s surface is pockmarked and cratered from numerous impact. The largest crater on Deimos is approximately 2.3 km in diameter (1/5 the size of the Stickney crater). Although both moons are heavily cratered, Deimos has a smoother appearance caused by the partial filling of some of its craters. Compared to our Moon, Phobos and Deimos are rough and asteroid-like in appearance, and also much smaller. In addition, their composition (as already noted) is similar to that of C-type asteroids that are common to the Asteroid Belt. Hence, the prevailing theory as to their origin is that they were once asteroids that were kicked out of the Main Belt by Jupiter’s gravity, and were then acquired by Mars. Phobos and Deimos were originally discovered by American astronomer Asaph Hall in August of 1877. Ninety-four years after the moons’ discovery, NASA’s Mariner 9 spacecraft got a much better look at the two moons from its orbit around Mars. Upon viewing the large crater on Phobos, NASA decided to name it after Hall’s wife – Stickney. Subsequent observations conducted by the HiRISE experiment, the Mars Global Surveyor, and the Mars Reconnaissance Orbiter have added to our overall understanding of these two satellites. Someday, manned missions may be going to Phobos and Deimos. Scientists have discussed the possibility of using one of the Martian moons as a base from which astronauts could observe the Red Planet and launch robots to its surface, while shielded by miles of rock from cosmic rays and solar radiation for nearly two-thirds of every orbit. 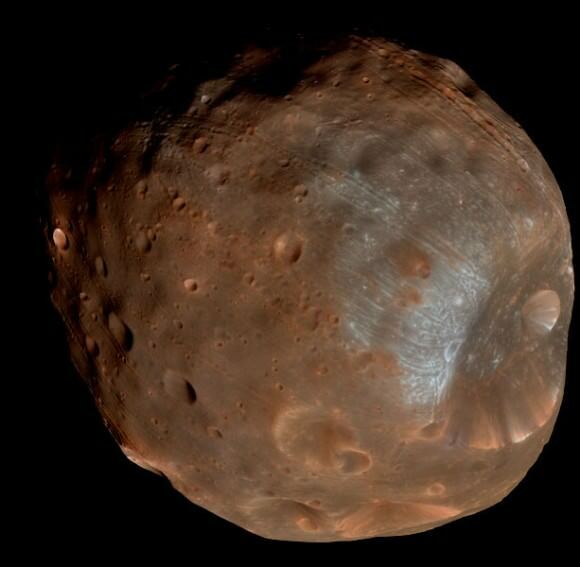 Here’s an article about how Phobos is going to crash into Mars in the future. And here are some great images of both Phobos and Deimos. Here’s NASA’s fact sheet on Mars, including information about the moons, and additional info from Starry Skies. Finally, if you’d like to learn more about Mars in general, we have done several podcast episodes about the Red Planet at Astronomy Cast. Episode 52: Mars, and Episode 91: The Search for Water on Mars.